This is not a Biblically-mandated feast. However, it is found in the Bible. There is a prophecy about this feast in Zechariah chapter 4, wherein the prophet sees a Temple menorah (7-light oil lampstand) being fed pure olive oil through pipes from two olive trees on either side of it. This prophecy came during the time when the 2nd Temple was being rebuilt, and it was fulfilled after the Maccabees regained control of that Temple from the Greeks. The Maccabees were a family of Jewish priests that revolted against the Greek occupation of Jerusalem in 168 BCE. The Greek army, that had been in Israel for over a century, starting with the conquest by Alexander the Great, began desecrating holy sites in Israel, to include erecting an altar to Zeus in the Jewish Temple and sacrificing a pig on the altar there. Worship of the God of Israel was forbidden and the Jewish people were systematically Hellenized into Greek thinking and ways of life. The high priest and his family finally overthrew the Greek occupiers by a series of guerrilla attacks at night, until finally Greece retreated. The priests then regained control of the Temple and began to rededicate it to the God of Israel in 165 BCE (hence the holiday’s name “Hanukkah”). As it was being rededicated, the Temple menorah was rekindled. However, there was only one day’s worth of olive oil to be found in the Temple, and it took 8 days to consecrate more olive oil. By a miracle from God, the olive oil in the menorah lasted a full 8 days, fulfilling Zechariah’s prophecy. Now during Hanukkah, a special 9-candle menorah (called a hanukkia) is used to commemorate the 8 days that the olive oil lasted in the Temple, but it also resembles 2 trees being added to either side of the Temple menorah to fill it with oil. God reveals to us in Hanukkah that He will always provide for His purposes. He miraculously granted a victory to the tiny family of priests over the strongest army in the known world at that time. He also provided that which was needed to rededicate the Temple to Himself. This was prophetically significant, as the Temple had to return to Jewish hands for Messiah Yeshua to walk through it less than 200 years later. For believers, we are now the Temple of the Living God, and we too must be rededicated to His purposes. We have been influenced by the world and pagan traditions, but God Himself can provide for us to be rededicated to Him. Yeshua observed the festival of Hanukkah in John 10:22-23. It was during this feast that He revealed Himself to be the Good Shepherd who lays down His life for His sheep who hear His voice. Let us hear Him and respond! Hanukkah is observed on the 25th day of the Jewish month of Kislev, the ninth month in the Biblical calendar. Hence, Hanukkah usually falls in late November or in December. 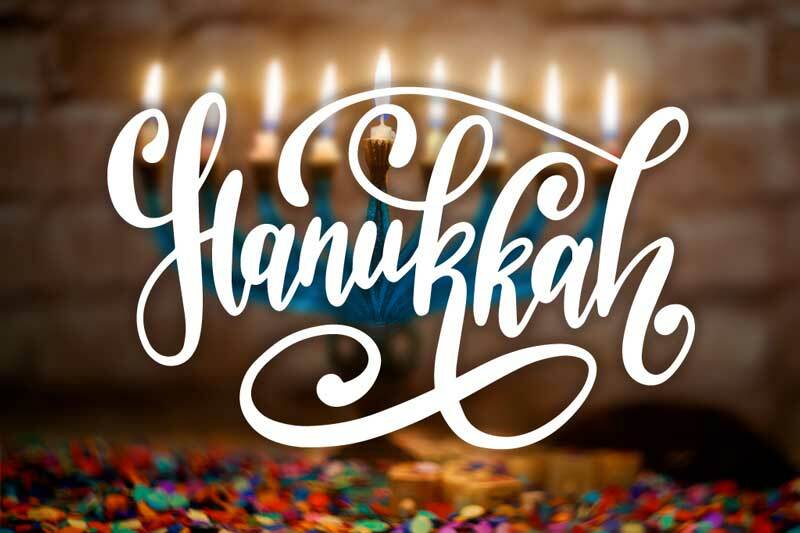 Each night, families gather together at sunset and ignite the middle candle first (called the Shammash or “helper” candle), then use that candle to light the number of candles that coincide with the night of Hanukkah, from right to left. Hence, there will be 3 total candles lit on the 2nd night of Hanukkah (to include the Shammash). The menorah is to be set near a window and burn at least 30 minutes, so that God’s people can be a light in their communities. After saying a prayer and reading Scripture, each night of Hanukkah is filled with feasting on foods made with olive oil (especially ‘latkes”, potato pancakes) and playing games, such as dreidel, which holds the initials for the Hebrew words “A Miracle Happened Here”. We are to celebrate Yeshua and our families, as we acknowledge the light of the world (Him in us). The Hanukkah celebration is a time for family and prayer. Hanukkah is a time to focus on the light of the world Yeshua. The Hanukkah (9 branch) menorah should be placed in a window or to publicize this great miracle. The candles are placed in the menorah from left to right and the candles are kindled from right to left. The center candle is called the shammash (caretaker/helper). The shammash is removed, lit, and used to kindle the other candles then returned to its holder. The first night of Hanukkah you will light two candles in your menorah, the Shammash and one candle for the first night of Hanukkah. The second night you will light three candles, the Shammash and two candles on the far right of the menorah representing two nights of Hanukkah and so on through the eight days! On the last night of Hanukkah you will light all nine candles in the menorah. You will need a total of 44 candles for the entire Hanukkah celebration. The candles should be lit at sundown and the whole family should be gathered (it’s acceptable to wait past sundown so that the entire family can gather around the menorah). The candles should remain lit for at least 30 minutes. The following blessings are recited when kindling the candles. Hebrew: Baruch Ata Adonai, Eloheynu Melech ha’olam, Asher Kid’shanu b’mitsvotav vitsivanu, Le-had-lik Ner Shel Hanukkah. English: Blessed are You, O Lord our God, King of the universe, who has set us apart by Your commandments and has commanded us to kindle the lights of Hanukkah. Hebrew: Baruch Ata Adonai, Eloheynu Melech ha’olam, She-o-so Ni-sim La-avo-sei-nu Ba-yo-mim Ho-haim Bi-z man Ha-zeh. English: Blessed are You, O Lord our God, King of the universe, who wrought miracles for our fathers in days of old, at this season. Hebrew (Abbreviated): Shema, Yisrael Adonai EloheynuAdonai Echad.Baruch shem kavod, malchuto, l’olam vayed. English: Hear O Israel, the Lord our God, the Lord is One. Blessed be His name, His glorious kingdom forever. Hebrew: Baruch ata Adonai, Eloheynu Melech haolam, asher natan lanu et Derek ha’Yeshua, b’Mashiach, Yeshua. English: Blessed are You, Lord our God, King of the universe, who has given us the way of salvation in Messiah Yeshua. After the blessings, kindle the candles. The following scriptures may be read, followed by prayer, worship and family fellowship. This is a quiet time, a time focused on our heavenly Father. Shut off the television, turn off the radio, and enter into the presence of the most high! God’s word is our light. Read Proverbs 6:20-23, Psalm 119:97-112 & 119:129-144.